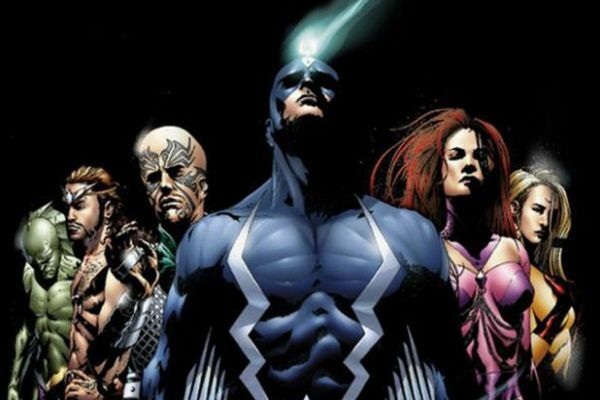 Marvel's next TV series Inhumans is coming and the studio is trying hard to convince us it's worth watching. Besides the fact that these characters are completely unknown outside of comic fans, the dodgy marketing has made it an uphill battle. 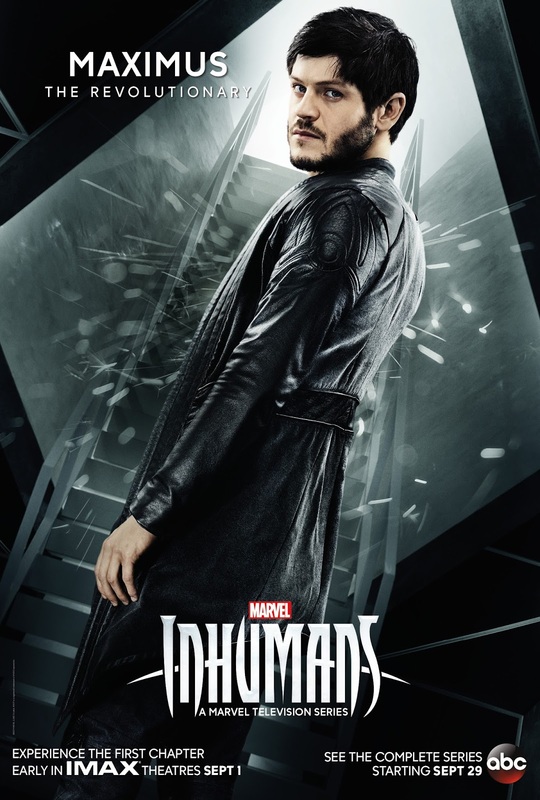 Marvel released some new character posters in time for the eclipse yesterday and they reveal some interesting stuff. 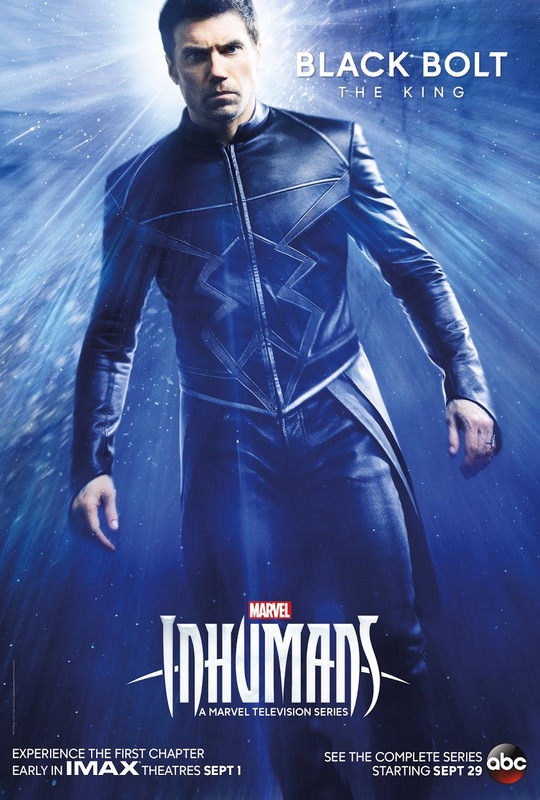 Black Bolt is the head of the Inhuman's royal family. Of all the characters it's Anson Mount that looks the most royal. This shot of him makes him look and feel like a king. Even though he doesn't (won't) talk because of his destructive voice, he's able to convey some real power. Unfortunately, the costumes still have a serious black leather 90's X-Men vibe. 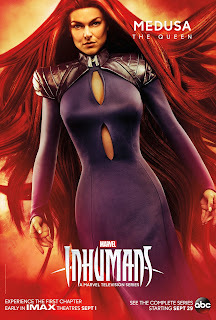 Serinda Swan plays Medusa the queen of the Inhumans and the wife of Black Bolt. The first trailers and posters had Swan in a hideous wig. The new poster is better and conveys the power of Medusa. She has hair that she can control and use like prehensile tails with superhuman strength. The special effects are a combination of practical effects and CGI. The combination is jarring but necessary right now. 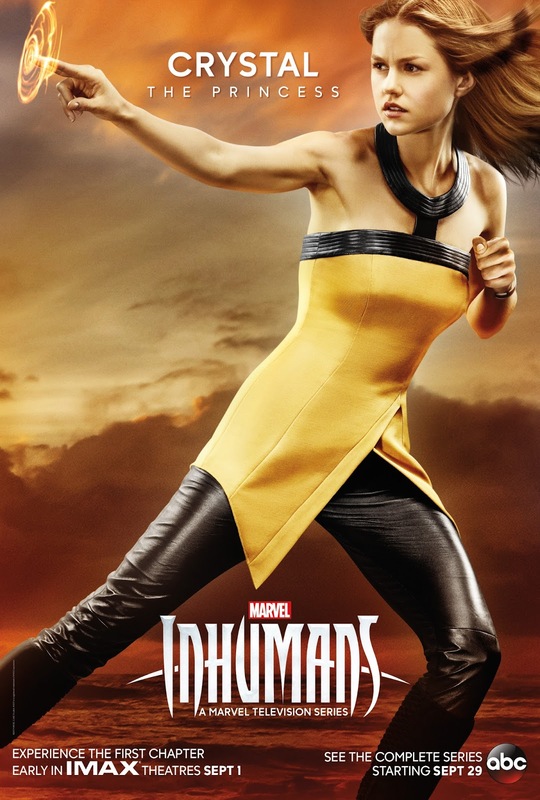 Overall it's looking cool and may do justice to the Queen of the Inhumans. 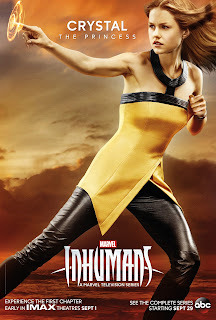 Isabelle Cornish plays Crystal who has the ability to psionically control the four classical elements: earth, fire, air, and water. By extension, she can control various other natural materials and phenomena such as metals and electricity. We finally get to see her using her powers, but there's not much to go on. Just a glowing disk. Fire maybe? In the comics, Gorgon has a set of wicked cloven hooves. This is the first time we've seen them and many wondered if he would have hooves on the show. Gorgon has enhanced strength and durability. He can also generate seismic shockwaves by stomping his hooves. Eme Ikwuakor will have that power on the show too. Gorgon is the muscle and "The Guardian" of the Royal Family. Iron Fist is been slammed for not casting a White person as the martial arts master. But, on the other hand, it's a stereotype that all Asians know Kung-Fu. It looks like Karnak isn't just about karate chopping bad guys. In the comics, Karnak is a brilliant strategist who can find the weakness in anything and exploit it. That's why he's referred to as "The Visionary". 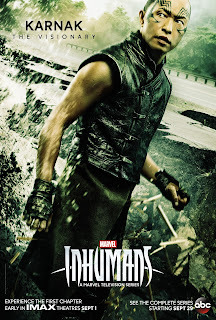 Kenneth "Ken" Leung, who plays Karnak, is an American actor of Chinese descent. 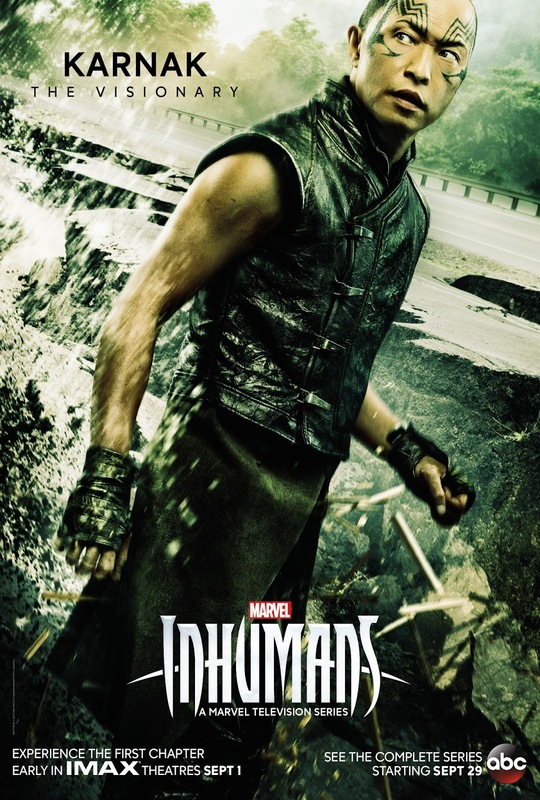 In the comics he's known as "Maximus the Mad" and Iwan Rheon does look insane. On Game of Thrones, he played the villainous psychopath Ramsay Bolton. 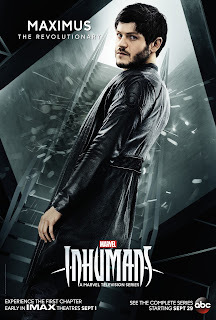 Rheon's given Black Bolt's brother Maximus Boltagon that same look. He's about to start eatin' people any minute. 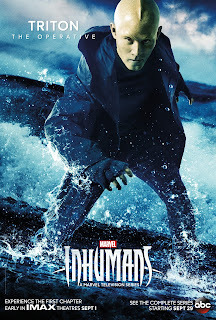 The comic book version of Triton has scaly skin over his entire body, webbed feet, a large dorsal fin running from his forehead to the base of his skull and along the length of his spine. It's probably hard to do in a realistic form for the weekly show, but Mike Moh looks ridiculous. Worf on Star Trek: The Next Generation wore a full headpiece and make up every week in 1987. 30 years later we can't come up with makeup that looks decent? The posters are pretty good and give us a glimmer of hope that the show will live up to the epic grandeur of the comic books. Will the show live up the promise? We'll have to wait till next month to find out. The first chapter of "Marvel’s Inhumans" will premiere early in IMAX theatres for a limited two-week run beginning on September 1, 2017. ABC will then air the entirety of the series, starting on Sept. 29. 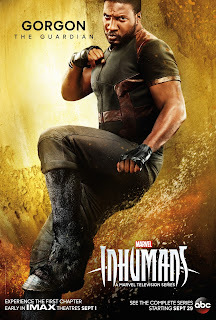 Check out all the Inhumans news, reviews and more at The Geek Twins! 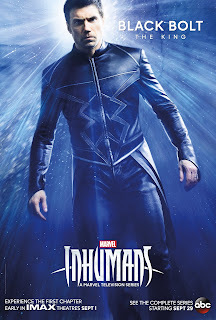 What do you think of Inhumans? Will you be watching the show? I'm curious enough to check it out, but it's been getting bad buzz and the trailer was received poorly at Comic Con. And if you can't interest those fans, you might be doomed. I don't know why they pulled the movie version for a lower-rent TV version. Where's Lockjaw the sorta-bulldog thing? I must voice my love for your kindness providing support to those individuals which should have help with this important subject.